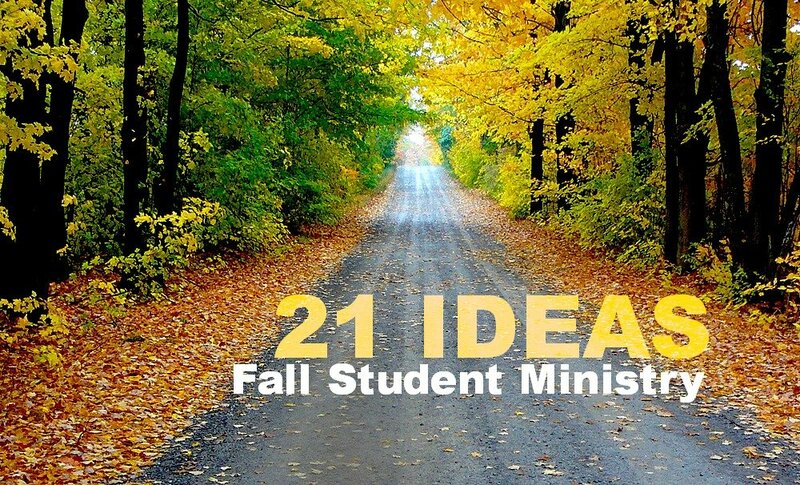 Here are 21 ideas as you plan for student ministry this fall. Use these ideas as a springboard to create something new in your ministry. Pick a date for a fall kick off. It may not be your first meeting after the summer schedules slow down, but an event geared toward outreach. You want it to be an entry point for students to connect. Invite your regular students to take ownership, invite people and make it a big deal. Invite all your contacts to be a part of the fall kick off. Publicize well. Pray for a great, solid start to the fall. Set up a parents / leaders meeting. One cool thing is to include students in this meeting along with families. Give out dates for the school year, talk about registration processes for events, have families sign a general transportation waiver. Share your victories (stories from the summer), vision (a preferred outcome of the future with a timeline), values (what the ministry and culture holds important and critical), and goals for the coming season. Make sure to get contact info from all parents. Thank them. Pray for them. Plan a night where the girls in your ministry get together and another night for guys. This can be done in homes or at church. It can happen the same night in separate places or two different times. It’s a great way to delegate leaders in your group and it’s a great way to build connections. You also have the added benefit of some deeper, more directed conversations about what it means to be a godly man or godly women in today’s world. I have visited many youth groups and it seems many have a ritual for group prayer. One group stands in a circle, crosses their hands right over left, connects with those on either side and prays. Other group puts their thumb out on their right hand while making a fist, and everyone put their hand in the middle of the circle to connect. Other groups have the habit of inviting one of the students to pray aloud. Some go around the circle to pray. Some sing. Some have certain ways to pray in restaurants. Some have a certain clap after they say “Amen”. What new ritual could you start? There are probably people in your church who would love to share their story with the students in your group. You may have friends who would like to come share their story with the students in your church. These guest speaker nights work well for a number of reasons including: 1) They free your thinking up for the week to focus on other aspects to the ministry besides teaching, 2) Guest speakers allow students to hear from another Christ loving adult, and 3) Guest speakers open the door to more inter-generational ministry and relationships. How to schedule a guest speaker? Pick a date in advance. Invite them. Let them share. Give them a gift for doing so. Have the students circle them in prayer after the session. Mission trips for student ministry groups are standard in the summer. But what about the school year? How can you give youth an opportunity for ongoing local missions? There are countless ways and opportunities. This is another great way to delegate to some of your leaders. It’s good for students to serve — even in small ways around the church. It’s something your small groups and their leaders can decide on their own and serve when they are able to. There is a great system in our group which includes monthly mission and service ministry opportunities for Middle School and High School. Some months are larger projects – taking day to travel to a mission setting for light work, painting and cleaning. Other times, it’s a two hour time block after church on Sunday where they buy supplies, cook dinner and then take dinner to two or three families around the community. Host a retreat for your students. Attend a conference with your group. These weekends are powerful for many reasons: 1) Students experience the message differently, 2) Memories are built with others in the group including leaders and 3) It’s good to balance day in and day out discipleship with a one shot, powerful retreat or conference that allows students to hear from God with a fresh word or call. [On a side note, for those of you in Illinois area, Ignition Middle School Conference is hosted in October; Fire-Up Sr. High Conference is hosted the last full weekend in February; and Beautiful U Girls Conference is hosted in mid April! You can find out more at www.harvestconferences.org). Leaders need to be refreshed with ideas, thoughts and connections. Leaders are learners and one great way to learn is to attend seminars and growth events. Find any you can and register. Equipping events range from local one day events to 3-4 day conferences. You can learn from both. Be sure to take a team member with you when you go. (For those of you in the Illinois area, you’re invited to attend The Well, A Seminar For Youth Workers, hosted in 6-8 cities around Illinois typically in the first two weeks of October – find out more by connecting on the Illinois Youth Ministry Network on Facebook). Who are your volunteers and leaders? Pinpoint your team and make sure they know how much you appreciate them. Give them a gift, a ministry book or a printed article they may find helpful for furthering their ministry skills. Take them out to lunch. Send them a thank you. Download a free copy of the 6 Motivations of Volunteers here. Read 10 ways to “pay” your volunteers. One simple way to help anchor your planning for the fall is to pick out your teaching themes in advance. Know what you will be focusing on each week. It takes some work up front, but planning ahead will help you involve more people, make it more creative and be more effective. Social media is one slice of ministry and often either under-used or way over-used for ministry. You can’t count on it, but you can’t discount it either. It’s one great thing to delegate to a team member. Who among your leaders and volunteers loves Twitter and Instagram? Invite them to do a trial of ministry for a season. See how it goes. It’s a great way to promote events, connect with students and keep a pulse on the selfie generation. We once had an old trailer that we let students sign their name of the door. I’ve been in several student ministries where there was a wall with student hand prints and names. If you have a space to begin this kind of tradition, go for it. Even if you’re not sure you can get permission to write on a door or wall, you can get around it by using a piece of drywall or other material that is portable but durable. These are especially helpful for students to feel like they belong to something. You can make the tradition that the second time a person visits, they can sign the wall! Start a tradition. I love t-shirts. They create identity. They are cheap. They provide belonging. They help in branding. They provide a witness. They aid in community. Create some student ministry shirts for the fall. Sell them at the parent meeting. Sell them to church members. Make them inexpensive so people can purchase them. They always go over better if you them available to sell right there as oppose to taking orders. Our group, at times over the years, has included the big dates for the season on the back of the shirt. I’ve been to lots of camps that have had theme nights. It’s a little corny, but if it works for your group, it provides lots of inclusion and belonging. It also has to fit with the mission for the night or event. Sometimes this works well in conjunction with leading a VBS or kids camp or something – western wear, crazy hats, etc. If there is a time to make it fit, plan for it and go big. I’ve seen this work well – and can be really attractive when it comes to food or refreshments. Sometimes people will just advertise taco night or whatever the menu is. You can have flavored popcorn night if you are planning to use a movie for one of your student ministry events. Communication is not easy these days. In addition to all the other aspects you’re probably doing, you need to keep adding to the list. If you haven’t already, now is the time to set up a texting service for your students and families. Simply Youth Ministry has a great service you can subscribe to. If you don’t have too many contacts, you can subscribe to Telefio, which offers a free version. Be sure you have an ongoing list of student’s friends, contacts, inactives and constantly be inviting them. Keep them in the email, newsletter and texting loop. Connect with them and pray for them. Teach the students in your ministry the value of invitation. Make it part of your culture. Leaders are readers and it’s important to make sure you are taking time to grow in ministry skill, youth development, time management, personal growth, Bible knowledge and whatever else you can read. Here’s a list of youth ministry books to get you started. Another way to grow is to read quick blog posts on youth ministry. Sign up to receive emails. Here are the youth ministry blog posts I have written. Aaron Helman has a great blog called smarterym.com. Here’s another one that sends emails out with resources – morethandodgeball.com. You may already do this to some degree. Involving student in worship can be scaled to your context. In smaller churches it often happens each week in some fashion – through ushering, teaching, volunteers, providing music etc. In fact, smaller churches can count opportunities for student leadership and participation as one of their advantages. But, I’ve also witnessed it being done well in larger churches as students participate in special Sundays, leading along with other adults in worship and tech teams and in other ways. On a recent trip to a mega church, I saw the student ministry bands lead worship as part of a graduation recognition Sunday. On many occasions I have seen youth Sundays. Ultimately you want students involved as often as possible, bet setting aside a student ministry Sunday is a good place to begin. Pinpoint your leadership students. Invite them to help you plan for ministry. Encourage their skills. Help them develop in faith and life. When I was in high school, four of us met with the youth pastor every Wednesday morning for breakfast. That was a forming time. It’s ok to have a smaller leadership circle. I know I just rattled off a bunch more things to do. But, maybe this idea would be the most helpful of all. Focus, streamline and go simple. Focus on relationships with youth leaders and with students. Streamline your schedule for a less-is-more-style of ministry. Make it simple – praying, inviting and walking through life with students as a Christian may have more impact that 30 events. I’m praying for you and your ministry to the next generation. If I can be of help to you, give me a call! We’d love to come lead worship for a retreat, provide a ministry team training session or have you join us for one the Harvest Conferences. Email me: tim@harvestministryteams.com. I write with church leaders in mind and I would be honored to have you join me by subscribing to the blog. You can take a look at the top posts here. The posts are categorized: pastors, worship leaders, student ministry and kids ministry. In case we’re just meeting, here’s little about my life. Too old for student ministry? I am a writer and ministry leader helping you gain ideas, clarity, and insights to confidently lead the church you serve. This video series, on sale now, includes four short videos (plus other bonus videos and resources) designed to help equip your volunteer student ministry leaders. Buy, Download, & Use Immediately! Use this link to shop Amazon and Harvest Receives Money! Thanks! I serve ministry leaders... If you need a fresh perspective in your ministry, let's talk about short term coaching. Download these digital files - 15 different cards including a quote, scripture and questions to use with your worship team. We currently use these cards for a quick conversation and prayer time after the sound check and before worship on Sunday. There are four identical cards on each page so you can print, cut and invest some time in growing the culture of your worship ministry.